Tourism Levy of 1% of Accommdation charge. Full payment of the total accommodation amount is due 30 days prior to arrival, unless the booking is made within 30 days in which case full prepayment is required to confirm the reservation. •	No children under the age of 6 are accommodated in Hotel Rooms (no Triple Rooms available). •	Children over the age of 6 can be accommodated with accompanying adults in the Manor Suite. •	Children of all ages can be accommodated in the Family Suite & Self-Catering Cottages. •	Children under the age of 12 are charged at R 900 per child, on a bed and breakfast basis, when sharing with an adult. •	No children under the age of 12 are permitted in the Main Dining Room. Alternative dining arrangements are available for families with children under the age of 12 years. •	A child minding service is available at an additional cost – kindly arrange with Reception prior to arrival. Matched only be the scenic beauty which graces the estate, dining at Walkersons is a celebration of the senses and skilled chefs. The craft-exquisite dishes served up at this Dullstroom restaurant demand only the freshest ingredients, and are prepared by an experienced team led by award-winning Chaine Chef Adri van Wieringen. The Walkersons Spa is a timeless place of peace and tranquility, offering guests the opportunity to indulge in a wide-range of treatments and procedures delivered by qualified, experienced therapists. 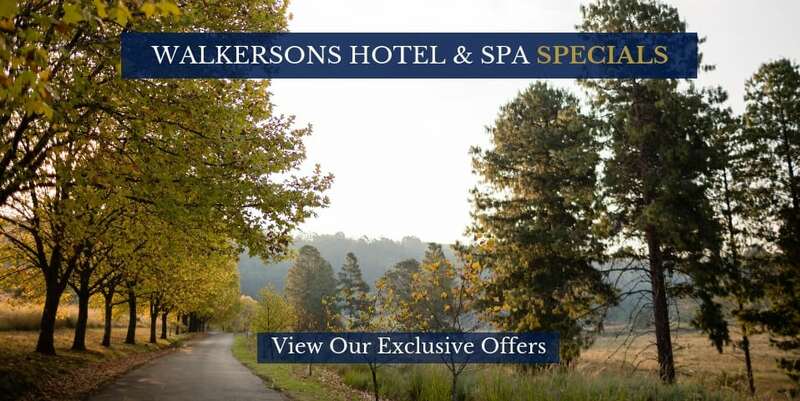 The ultimate escape for pure self-indulgence, the Walkersons Spa is a feast for your soul and senses.